On Friday the 27th of March at around 23h our plane landed at Dublin airport. There my two travel companions and me got on a bus that would bring us from Ireland’s east coast to it’s west coast, and three hours later we arrived at our final destination: Galway, City of the Tribes, a city of seventy-five thousand people on the River Corrib. We were staying in the Bunk Boutique Hostel, which has the seeming advantage of being located across the street of the bus station: so very easy to find. The three of us had booked beds in a shared dormitory of six, the smallest room available, and we where hoping finding it empty. But no, three of the six beds were taken. Two of the available beds were solitary ground level ones, but the third was the top level of a three story high bunk bed. Agreeing that this one was the least desirable, we played rock-paper-scissors to determine the unlucky owner. I can only imagine what our roommates must have thought, seeing three men playing this game at three in the morning, in the semi-dark, to determine the bed ownership. The advantage of being close to the bus station turned sour when the buses started coming, waiting and going very early in the morning, especially because the windows next to the other occupied beds were open. At around quarter before seven I noticed I was not the only one among my friends laying awake, so we got up, got dressed and got out ex ploring the city. The sky was grey and it rained a little: the dominating weather conditions of the trip. We walked to Eyre Square and then through Shop Street, the main shopping street, towards the River Corrib and Galway Bay. Breakfast was included in our stay and was served from eight ‘o clock onwards, so made sure we were back at the hostel by eight. It was basic but sufficient: there were three types of cornflakes, brown and white toast, three types of jam, milk and coffee available. The goal of trip was to visit a friend, Willem, who has been working and living in Galway for the past nine months. So after breakfast we set out to achieve our goal and walked for about an hour in eastern direction to Doughiska, a suburb of Galway City, passing the Greyhound racing track where we refrained from placing bets. We arrived in a sort of gated community of a few hundred similar houses called Fiodan, where our friend lived: quite a nice neighborhood, with a lot of well maintained green. I rang his bell, twice, and on his first floor a window opened where an old lady appeared asking what we wanted. I had the address wrong, my cell phone’s battery was dead, and to make matters worse none of my travel mates had his current number. We walked a bit the streets of the neighborhood and asked passersby if they knew a bearded Belgian guy living nearby. Non did however. We had come a long way and were so close but it seemed we were stuck. My travel mates might not have his current number, but they had his mothers number, and she guided us to the correct house, which was just around the corner. It’s a small three bedroom house with a spacious balcony and a nice view. We got a tour of the place and noticed our goodbye gift to him, a signed Belgian flag, which we gave him when he left Belgium some years ago, in his room. Against all agreements there was no cider in the fridge but our friend corrected the situation and jumped on his bike to get some. Once all the cider was processed, we took the bus back to Galway City. We had lunch in the McDonald’s of Shop Street and afterwards explored the city further. Walking back to the River Corrib and following it upstream towards Galway Cathedral. The light drizzle had changed into a downpour, getting us all soaked. We waited out the rain in the Cathedral, which is quite ok, but since it’s only fifty years old, it lacks history. 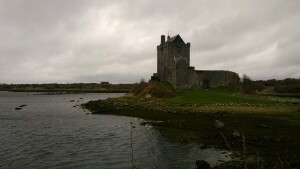 Since I wore a leather jacked, I didn’t have a hood, so to keep my head dry, I went looking for a Sou’wester, and Galway being a fishing town, I expected to find it. Easier said than done, it took us several stores and several trips crisscross the city, in the rain, before our local friend remembered a small fishing and shooting shop, Duffy’s, where they would certainly have what I was looking for. Ironically we had passed this store already several times that day, before looking for a hath, without paying any attention to it. 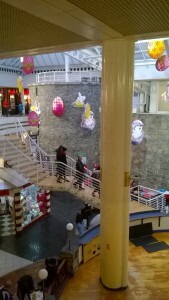 They did have what I wanted and with the joy of a small child I walked back to the hostel, along the way going through a shopping mall which has parts of a medieval castle incorporated into it. We refreshed ourselves at the hostel and scoured through TripAdvisor to find a good restaurant with local cuisine nearby. We decided on Oscar’s Bistro, a little but cozy fish restaurant across town, just on the other side of the River Corrib. We had some difficulty finding it, mainly because of the piercing wind numbing our senses. We arrived shortly after the restaurant opened and we were the second party attending, but it wouldn’t take long before the restaurant was full and people had to be refused at the door. I counted myself lucky being, for once, early. 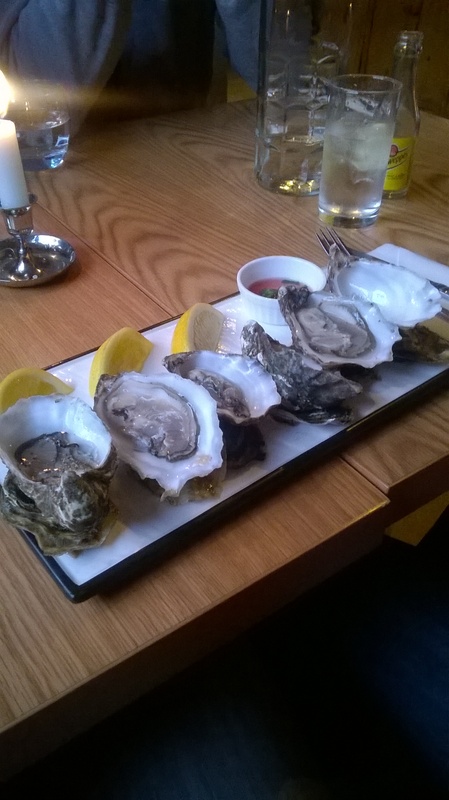 As appetizer I had oysters, fresh from Galway Bay, and prosecco: these were the best oysters I ever tasted. Great structure and flavor. The shellfish was followed by Gambas prawns in garlic and lemon butter: the dish was nicely presented and tasteful. Monkfish, or sea-devil, was to be the main course: one of my favorite fish for its big and meaty structure. To put the devil to rest, we moved on to rhubarb crumble with vanilla ice. And concluding the meal with, of course, an Irish Coffee. Of the entire meal, two things stick out: the superb oysters and the attentiveness of the adorable waitress. We were really taken in by the restaurant, it was also not expensive, we paid around €60 each, and were planning to comeback the following day for other fish and more oysters. Sadly Oscar’s Bistro was not open on Sunday evening. We walked back to town and in Shop Street we went into the Coyote bar, looking for a bit of fun. We found only a handful of men watching the Netherlands – Turkey football match. We ordered a Guinness and joined them. Then a hen party came in, and another, and another until the bar was filled with partying women celebrating the wedding of their friends. Quite the turn around, apparently the bar advertises for its stag/hen party location. There was a cocktail bar, but the waiter was quite incompetent and the cocktails contained almost no alcohol. Around midnight we left the bar and walked to the hostel. At the Eyre Square we said our Goodbyes to Willem and lent him some bus money because not all bus drivers give change, after which he got into a cab. On Sunday morning we had breakfast at the hostel and decided to take the Cliffs of Moher bus tour. 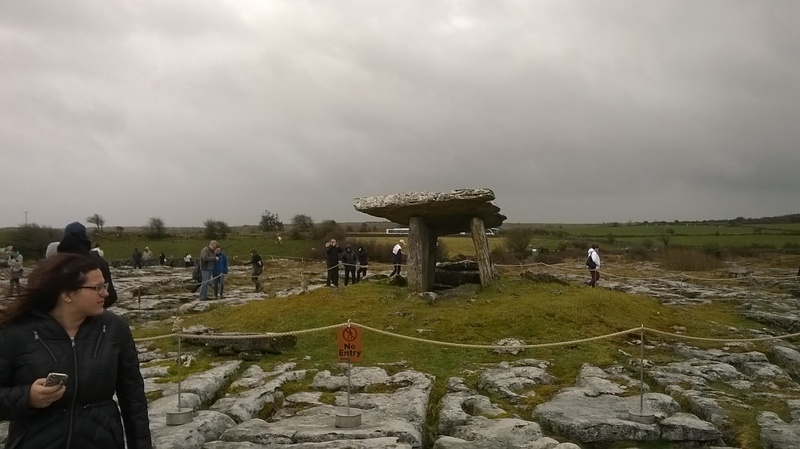 This tour travels south of Galway, to the other side of Galway bay, over the limestone covered hills with its grikes and clints to Doolin and the Cliffs of Moher. We met Willem at the bus station across the hostel and the four of us set off for a day of sightseeing. 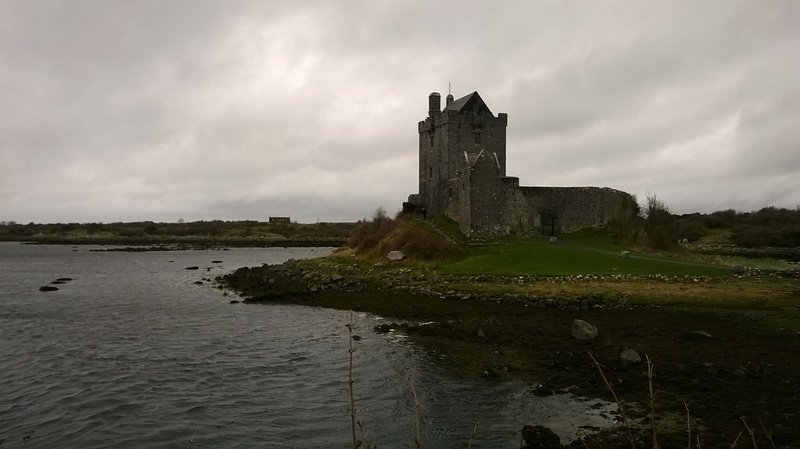 Our first stop was Dunguaire Castle, a 16th century tower house on the southeastern shore of Galway Bay. It was a quick 15m stop, a mere photo opportunity, because it was not possible to visit or enter the castle. Our bus driver talked ceaseless, first about the state of Ireland’s economy and people of the years from the potato famine, to the Celtic tiger years which ended in the recession, and the now the recovery. Then about every detail along the road, including local folklore and historic events. He did his job well. Another highlight before the cliffs was the Poulnabrone Dolmen, a portal tomb of around six thousand years ago in the Burren. The structure in the desolate limestone landscape is quite beautiful, it gave me a sort of melancholy feeling. We continued to Doolin, a small coastal village where we had lunch in a local pub. There are walking trails from the village to the Cliffs, which are situated around 8km to the south, but we stayed with our bus. The cliffs themselves are spectacular, rising up to 200m above the Atlantic. The ocean pounds them violently and I’ve never encountered a fiercer wind then on the edge of those cliffs. We saw and felt upside down rain: water drops taken by the wind and pushed up along the cliffs until at the top edge they form little geysers. And it was not even a stormy day, only a bit grey. 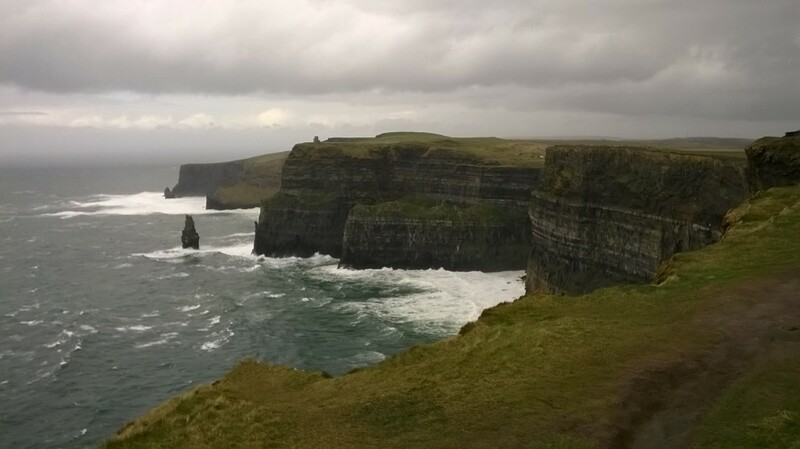 The cliffs have featured in a number of popular films, probably the most memorably of them is Harry Potter and the Half-Blood Prince where they are the setting of the sea cave in which a Horcrux is hidden. We had an hour and a half free time at the cliffs, and we made good use of them, walking along the top as far as we could in the time provided. Strangely, we met our hostel roommates along the trail. When we left our room they were still in bed, and what is even more strange, when we got back to our room after the bus drive back to Galway, they were once again in bed, at around 6 ‘o clock in the evening. That evening no Irish fish was to be on the menu, but Irish steak. we had found a promising restaurant on TripAdvisor, but it was full, and there was waiting queue of three parties in front of us. They suggested leaving our mobile phone number and waiting, but we were famished. 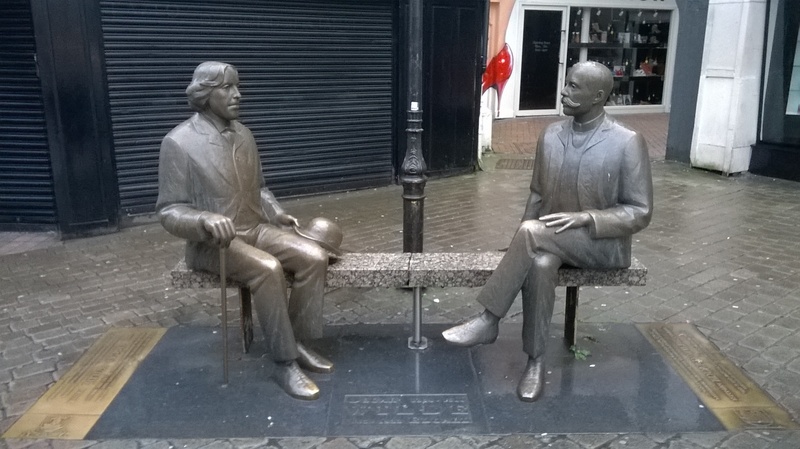 Willem advised us to go to Maxwell’s in Shop Street, he had been there before and was quite pleased with it. You could catalog it as a family restaurant, a clear space with lot’s of light, several tables were occupied by parents with small children. 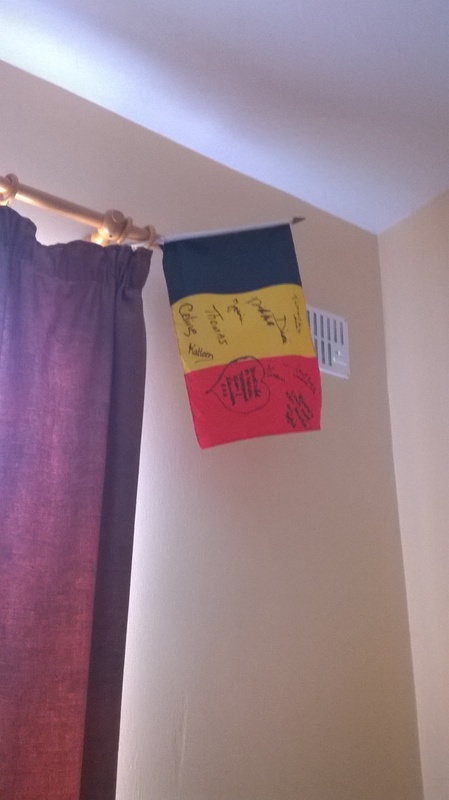 And one table was now occupied by four Belgian boys. Maxwell’s doesn’t have a liquor license, which became apparent when we tried ordering a Gin-Tonic to kick off our meal. The Irish steak I had was good and the Chilean red wine accompanying it was decent. We spent the remainder of the evening in Sonny’s, a pub in High Street, drinking Guinness and watching the Irish football team draw against Poland. Once more on Eyre Square we said our Goodbyes to Willem, this time it would take longer than a day to see each other again. Monday morning at eight ‘o clock we were faced with a closed breakfast room, the attendant had overslept, probably not expecting anyone to be so early eager for food. But we were in a hurry, we had a bus to catch. Check out was simple and quick and we got on the Dublin bus at 8:45. A bit before noon we got off our bus at O’Connell bridge, we went up and down O’Connell street, crossing the River Liffey, moving thourgh Temple Bar towards Christ Church. At the cathedral we changed course to the National Gallery. This museum can’t be compared to its sibling in London, it is much smaller but nonetheless it has some works worth visiting such as Caravaggio’s The Taking of Christ. We had some coffee and a brownie in the cafeteria of the museum. While discussing the things we’d seen these last couple of days we became aware that spread around the room three woman were busy breastfeeding their babies. Thinking of the hens parties of the first evening it appears the Irish do things separately together. When we left the museum rain was pouring down, we headed to the shopping street, Grafton Street, but decided against another march through the rain. In Suffolk Street we saw a pub O’Donohgues and wanted to take shelter there for the remainder of the afternoon drinking Guinness. But we still had to figure out how to get to the airport, so after some beers we headed into the rain searching for a tourist info point, we found one at the end of Grafton Street and there is an airport shuttle that had a stop nearby. 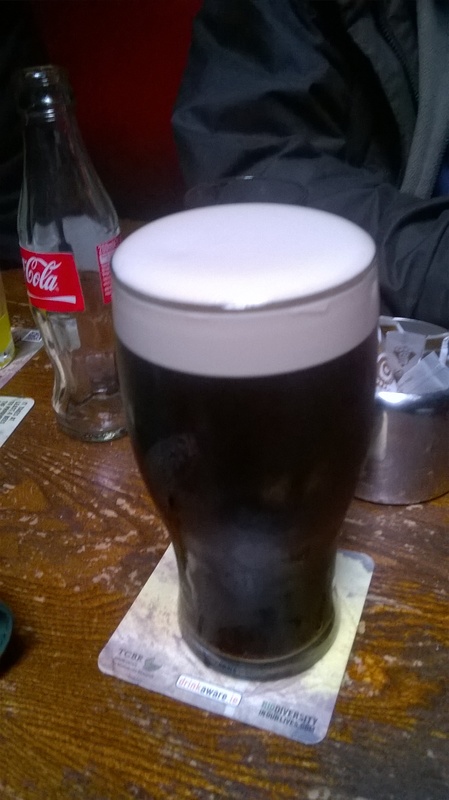 Glad with this, we returned to the pub for some more Guinness. A bit before five ‘o clock we headed through the rain to the bus stop and after waiting quite a bit in the rain, the bus appeared. We still had an hour forty-five before take off so there was little stress. Dublin rush hour however raised our stress levels. The bus trip that should have taken us about twenty minutes now took us well over an hour. We got to the airport five minutes before the official closing hour of our gate. We ran to the security check where there was luckily no queue, we passed and continue running to our gate were we arrived in the nick of time, only to see that our plane had yet to land. No stress.